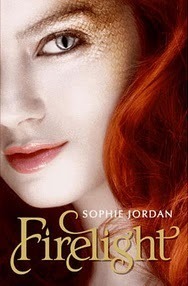 Review: 4.5 Stars - Firelight, the first in a series from author Sophie Jordan is filled with greatness – great characters, great plot and great writing. I found myself immersed in the pages as Jordans unique idea became clear to picture as a new supernatural creature evolved before my eyes. Jacinda comes from a rare race of people called the Draki. Not fully human and not filly dragon, able to change between the two halves. She’s even rarer as each Draki has a set of abilities making some more valuable than others. She’s a breed that hasn’t been around for a long time – a fire breather – which the pride that she lives in and calls home has plans for in the future. Jacinda is one tough teenage girl who’s promised to the Prince of the Draki, Cassian. She has no idea just what the elders of her race have in store for her, and once things take a turn for the worse, her mother packs her and her sister and moves them to the desert where she hopes they won’t be found and to try to force Jacinda into a normal life, away from the Draki. While I loved Jacinda and her strength and her fighting instincts while she tries to find a way out of the corner she’s put in, her mother and her sister were a huge thorn in my side. I understood why her mother moved them, but forcing Jacinda to go down the same path as she did frustrated me just about as much as it frustrated Jacinda. And her sister! Don’t even get me started. The initial meeting between Jacinda and Will was thrilling, fast paced and unexpected. Their relationship is one that’s doomed from the beginning. When they cross paths again she doesn’t know what to do, just that she’s drawn to him when she shouldn’t be. Will and his family are hunters of the Draki and while he doesn’t’ know what she really is, she knows what Will and his family are capable of. I more than loved the interaction between the two and the push and pull of their relationship because of who they both were. When Will finds out he has two options and its right then at that moment he becomes the person he’s suppose to be and not the one he was born into. Of coarse it wouldn’t be a true review of this title without more mention of Cassian. Cassian, oh… can I please have some more? Lol While I didn’t agree with his actions, he has many redeeming qualities (or does he?) that come through blindly by the end (or does it?). However, it still leaves me questioning if is a good guy or a bad guy. The verdict is still out on him. The short chapters, amazing story and characters, the ending, the romance… the mythology, all wrapped together, making Firelight a perfect addition to paranormal YA titles. I’m more than looking forward to the next book – Vanish – to see what happens next for Jacinda, Will and all the people around them. FTC Disclaimer: I did NOT pay for this book, nor have I been compensated at all in any way or means for reading and writing this HONEST review. **Note - I did also purchased a finished copy of this title. I still haven't read this one. I've been going back and forth. This author was at the big RWA signing last week and I could have gotten her book, but I didn't :( Darn! Dragons, and firebreathers makes me kind of wary of this book, but after seeing so many positive reviews I think i'm going to have to get it a try. Thanks for the review! I've been looking forward to reading this, even though there's been mixed reviews. Awesome review! I still haven't read this but I really should soon and I love the idea of the Draki race. I've got to read this before Vanish comes out!